Innocent until proven guilty? Yeah, right. We’re talking about reality here, and Lancaster County’s wheels of justice turned slowly in that era, unable to match the speed of a college football season and quite possibly the greatest college team ever fielded. In the mix, Riley Washington’s tale is that of crushed wishes and winsomeless woe, a victim in the wrong place at the wrong time and fingered by the wrong sort. It’s a full-scale indictment of Lincoln’s 90’s law enforcement community that the Lincolnites Gang remained a virulent, violent, and vehemently voracious variable in the social and street strata of a college town so relatively small in size, and Riley paid a terrible price for this perceived dereliction of duty. His was a bent reed and a smoldering wick, a man who saw great personal lows during the highest of team highs, and he lends a sobering perspective to this tale. 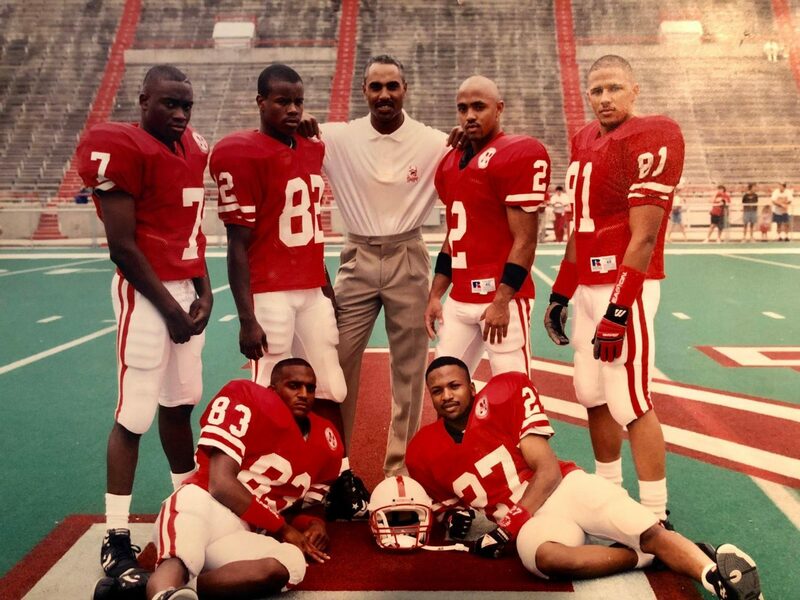 In the 1995 Nebraska Football Media and Recruiting Guide, titled Staying Focused, his position coach Ron Brown had this to say: “Riley’s speed is much publicized, but he is developing the other important areas a receiver needs: hands, poise, precision and knowledge…” He developed a thicker skin, too, and shares with us his insights and memories of the blood, sweat and tears… quite a few tears. Question:. What’s keeping you busy these days, Riley? Riley Washington: Well, actually I work with Vershan Jackson. I’ve had a few opportunities … but I’ve been wanting to get more into the personal training and that type of sports training. And not just for football, but for other sports, as well. And what I like to do is gear it towards kids, because being from San Diego and seeing that speed is something you strive for, I didn’t see that same type of emphasis here in Nebraska. I always saw guys trying to get bigger and stronger but not as much focus on the ‘faster’ part of it. There seems to be the misnomer or the myth that you are born with speed and you can’t really increase it, and I know that that’s not a fact. You can increase full-on speed just by teaching proper mechanics and showing people how to run. Q: Exactly! Like Randy Gobel used to do. You had quite a bit of speed coming out of San Diego, right? RW: I was alright. (laughing) I was alright there. I think I still have the state record there in the 100 meters, so that’s one of my –not really accomplishments, but one of my proud moments, I would say. Q: How did you end up attending the University of Nebraska? RW: I had never thought about Nebraska as far as football was concerned, about the Midwest, because what I saw as a San Diego kid was always UCLA and USC and the Pac 10. And I was obviously aware of Oklahoma and, believe it or not, I was actually a fan of Colorado before I came to Nebraska for a recruiting trip. Q: It seems to me that Colorado at that time always had something of a foothold in San Diego. What contributed to that? RW: I don’t know if it was the location or maybe it was just Colorado, the name. Maybe you think about pro teams and you think about the mountains and stuff like that. 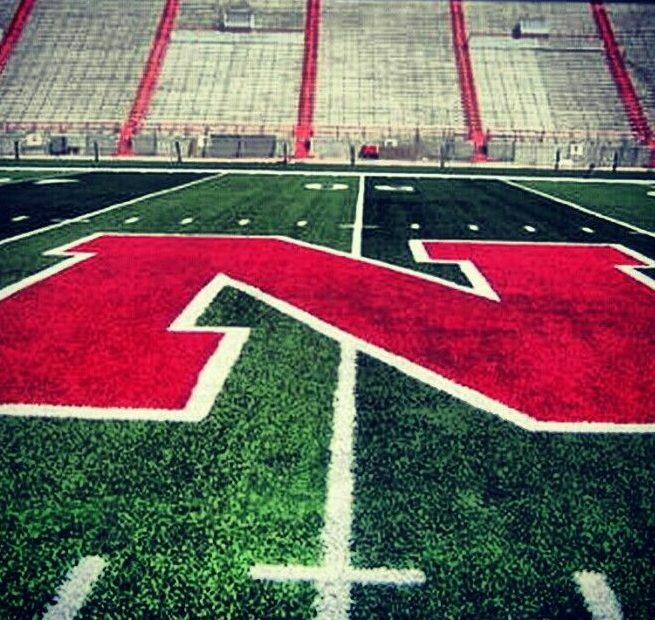 When you hear about Nebraska the first thing that comes to mind is the corn and cornfields. (laughs) When you’re from a warm climate of San Diego and you think of a big city or semi-big city life, Colorado fit the bill. That was a place that a lot of guys I knew of personally went to: to Colorado. One of the guys I knew from the San Diego All-Star game was Rashan Salaam from La Jolla Country Day, who played 8-man football coming up. So I knew that guy and he chose Colorado and didn’t think it was too bad, with the big city life that seemed more exotic than, say, Nebraska. It may not necessarily be that way, but it sounds that way, growing up and hearing stuff, you know? And for me, what actually made me -looking back now I was actually an Eric Bienemy and Darian Hagan fan and the black team color and all- that appealed to me, but I didn’t go on a trip there. I was actually asked to go on a trip there but never did. Q: Really? So was Coach Brown involved in your recruitment? They’re really spiritual and go to church a lot, so they were on the same path, you know what I mean? So it meant something with his in-laws being in San Diego and Coach Brown being my recruiter. Q: Do you remember much of your recruiting trip? RW: Oh yeah, like it was just yesterday. It was December 18th, 1991 and I wore a green loose-knit sweater. I brought no jacket. I’m thinking, ‘I’ll bring a sweater because it’s cold.’ I’m not realizing loose-knit isn’t really applicable to this type of weather, and I’m wearing that and I’m thinking, ‘It’s cold here.’ I had to get a jacket from the equipment room. That was at night, but coming in on my recruiting trip and flying into Nebraska, when I first came in all I remember is looking down from the plane and seeing nothing but cornfields. I asked myself, ‘Are you really sure you want to go here?’ Because I got into the Lincoln airport and it was just cornfields, and I’m used to seeing some other sort of buildings, you know? Like around San Diego’s airport you have businesses and office buildings and such. I didn’t see any traffic and I was, ‘Okayyyyyy.’ And then I went to my dorm and it was a gloomy day. I went to my dorm room and I was the only kid there. There was nobody else. RW: Right. So I ended up going to the rec center and a couple guys were playing basketball, but I didn’t know anybody. Then they came out and had practice, and then it was Tommie and all the other guys who came out on their recruiting trip. And nobody really knew each other, but a few guys were whispering and talking, “That’s Tommie Frazier, he’s supposed to be the big-shot quarterback” and all this, you know? You’re all thinking of coming in and you want to be the best, you know? I remember my whole recruiting trip as far as what I did, who I was with, the guys I met first. Q: Who was the first guy you met? RW: It was Abdul Muhammad, he was my host. Q: He was from L.A., right? RW: (laughs) Yeah. Yeah. We actually went there for spring break one year. Now, how’s that for spring break? (laughing) But yeah, he was my host. And I remember meeting Clester Johnson and we went to a party and -who threw the party?- but it was Duane Wiles and Ed Stewart at the party, and I met Reggie Baul that night, too. I met a lot of guys that night and had a good time. They did a pretty good job of recruiting me. Q: Did you feel like you connected with them? Someone you could hang around with for the next four or five years? RW: You know, when I first met them I didn’t think about four or five years, I just thought they were pretty cool guys. I went home -and Abdul was there from California, so he understands the lifestyle- and it helped me to adapt to things and all that. They were pretty cool guys. I went on another recruiting trip prior to that, and from that experience to this it was night & day. Guys really accepted me and brought me in and let me know what was going to happen and showed me the facilities and things you need to watch out for. From that point on in the recruiting trip I felt pretty good, because I could feel like I was part of the team already. Q: That ’91 class, it seemed to be a bit of a special class. It seems that you guys, for lack of a better term, had a little more ‘piss & vinegar’ than most classes. Would that be apt? RW: You know, I think it was a mixture. It was a mixture of that ’91 class with the ’92 class. We brought our own swagger in and our own style just the same way every class would do, but when it came to gelling, I think we gelled better with the ’91 class. We just gelled real well with that class and guys like Abdul Muhammed and Troy Dumas and Dwayne Harris from that ’91 class. Those were guys I all hung with. And all the guys I knew, we’d all get together with guys from that class. And I can’t say much about how it is now, but as opposed to, say, the class of ’94, I felt there was a better mix between the ’91 and ’92 guys. Q: And as far as guys explaining “what things were about,” were there any grand dreams or grand plans as far as goals to become national champs? And coming out of high school you don’t understand what the concept of national championship means. You don’t know much about the national championship other than that it’s like the Super Bowl. I mean, at least for me, I wasn’t a football-head or a football junkie coming out of high school. I didn’t live my life and eat, sleep and drink football, I did other things. So for me, the concept of the national championship didn’t really set in. Obviously, I knew about it, but I didn’t realize this was that type of program. Like I said, I’d heard of Nebraska but I didn’t follow polls and things like that. RW: Right. You had pro baseball teams, pro soccer teams, pro football teams, at one time pro basketball teams. So we had other things going on at the same time. I didn’t stay at home a lot. I didn’t watch teams too much growing up. I was too busy outside and running around and out there in the streets than to be worried about watching TV, so I didn’t watch football. It was like NFL Football, you watched the Chargers and those things. And I was a 49ers fan, too. I’ve always been a 49ers fan. Q: Do you recall your first few days on campus? Any special recollections? RW: I’ll never forget, I was sitting on the field one day and we were just stretching out and I’m just watching everybody in the rows and everybody wearing N’s on their helmets, and it just hit me, “I’m in college.” That’s when it hit me. And you know the N? The N is infamous. 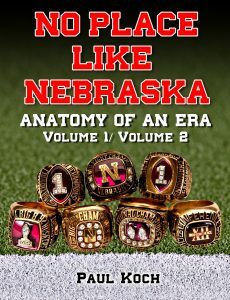 To actually sit there and know that you were sitting among a bunch of guys here and you were part of this, ‘This is Nebraska and you are in college.’ It just hit me like a ton of bricks, ‘Wow! This is real cool!’ The first one from my family to go to a university was myself, and for me I was just, ‘Wow, I’m in college. I’m here.’ That’s one of my biggest accomplishments and also, in a sense, my biggest regret. RW: In the sense that it was great, because I’d always planned on going to college. It wasn’t like it just happened. I always planned on it and studied and made the grades and whatnot, but that’s the way I was going to go to college, through sports. And I wanted to go to college, but the whole concept of books and tuition and rooms and board and all that, I had no concept of the cost of that. And we didn’t have a lot of money, so the only way for me to go to college was through sports. 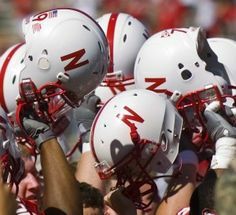 Q: Do you recall anyone sharing how much football meant to Nebraskans? How big it was? 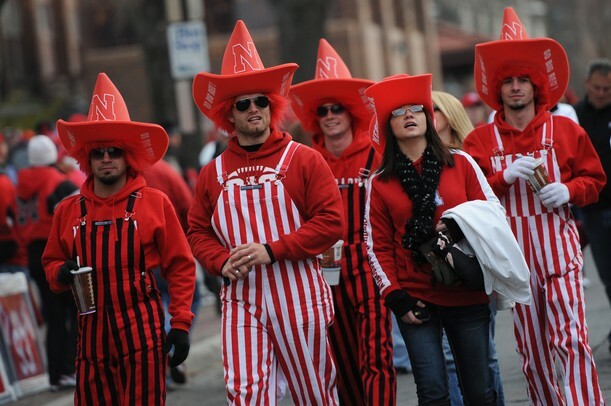 Later on when I was entering the stadium for our first game, the first home game, we were riding up to the stadium on the team bus and I’m seeing people out there on walkers moving with ten gallon hats -red hats with N’s on them- walking to the stadium. I was, ‘This is like ten in the morning! And people are here already?! And on game day this is the third largest city in the state? Are you serious? !’ I couldn’t fathom that. And it’s not like things were in San Diego for the Chargers, much less San Diego State. It’s one thing to see a fan around town on game day wearing a team’s colors and stuff, but to have that many fans in one spot? It was crazy. Q: You were used to seeing someone in a Chargers jersey in the supermarket or maybe a neighbor wearing one earlier in the day doing errands or something, but the sheer numbers congregated in one place was more than shocking? RW: Exactly! In droves! ‘Wow!’ And again, it wasn’t a bunch of young college kids, it was everybody from every age group, it seemed like. There’d be moms rolling in, and old people, wow. And then people drive from six, seven hours away to come to a game? They’d come to a game that lasts, what, sixty minutes? They drove six hours and it lasts one hour. Q: So you get there and start practicing and Coach Brown -who was recruiting you- now he’s coaching you. What did Coach Brown bring to the table? RW: If I had to summarize Coach Brown at the time, I was thinking -for me- like a relationship of what a kid to a parent would be. Your parents say certain things to you, but you being the kid you think you know everything, so you tune things out. He tells you everything and you’re, ‘Yeah, okay Coach.’ Football-wise, it was cool, but about other things like that, I kind of tuned out. RW: Yeah, right. ‘Stop pressuring me to go to Bible study with you.’ I don’t want say ‘pressuring’ me, but, ‘..stop putting it out like it’s got to be this way or no way.’ But now I catch myself quoting him, telling the kids, ‘We’re creatures of habit.’ Who said that to me first? That was Coach Brown, every day, “creatures of habit.” Not that it mattered then, but now I’m preaching that to my kids and other kids. Crazy. Q: Some guys butted heads with Coach Darlington and Coach Brown. It seems both of those guys were perceived as a little hard-headed and it was “my way or the highway, you’ve got to come along to get along,” that sort of thing. Did you ever feel a sense of that? RW: Working with Coach Brown, I didn’t feel like it was a ‘my way or the highway.’ I never felt that way. Maybe it was because the concept of me playing receiver was so different for me, because I never played receiver until I came to Nebraska. Q: Were you a running back? RW: I was a running back and defensive back in high school. RW: Primarily running back, but I played some defensive back, too. For me, I was always learning something, you know? I wasn’t the best ‘hands‘ receiver, but the concept of throwing the ball at Nebraska didn’t really matter anyway. (laughs) But for me, I was always learning. I remember certain pointers he gave then that I picked up on and still remember them to this day and tell my kids what to do. I took his advice. And for me, he was a good coach. He did me a very good favor being my coach. Q: As far as the culture, the atmosphere around there, how would you describe it at the time? It seems to me that there was this quiet confidence about the campus, a humble self-belief at the time. There was the ‘Unity, Belief, Respect’ thing at the time, did you feel that had much to do with that era, too? RW: I look at it as the same way you would have it in high school: if you put any group of people together they eventually learn to have your back, and I think within the football team it was the same thing. We had some football guys who hung out with their favorites and things like that -I had a few guys I hung with- but the team was still all one big family, though there was never a concerted effort to say, “Hey, lets all go over to so and so’s house.” We just hung out with our group, and there were always little factions and groups within the team, but I think people ought to know there was no friction or malice among the groups on the team. Q: Funny you say that, because Lawrence Phillips said about those days, “There were no cliques,” and that everyone, for the most part, got along. RW: Right. And Lawrence being from California as well as I, usually when you have factions or separate groups there’s going to be problems. A group here and a group there are usually separate for a reason: “They wear the wrong clothes or they drive the wrong car or they’re from a different neighborhood.” …You had the same situation and you’d hang with your own clique, but to go hang out with another group of guys was not a problem. It was a family. You could go where you wanted to go, there was no problem. Q: Growing up in southern California you were probably used to seeing a lot of Hispanics, Asians, Chaldeans, et cetera. Were there any cultural hurdles you had to overcome or deal with? RW: Yeah. You know, my biggest culture shock was the ratio of white people here, to put it bluntly. Not that I had a problem with that -because my wife is white- but my high school was predominantly Hispanic.